Are you looking for a quick and easy breakfast to make for a crowd? 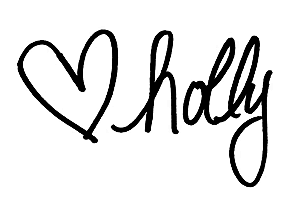 And BTW – is healthy AND paleo AND Whole30 friendly? 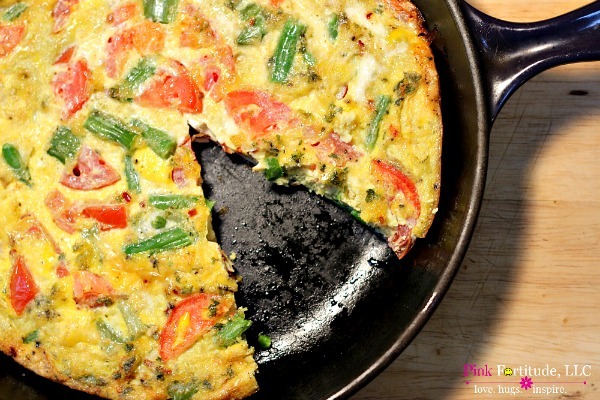 This vegetable frittata is sure to please. It sounds and looks fancy, but it’s so easy to make. Trust me! 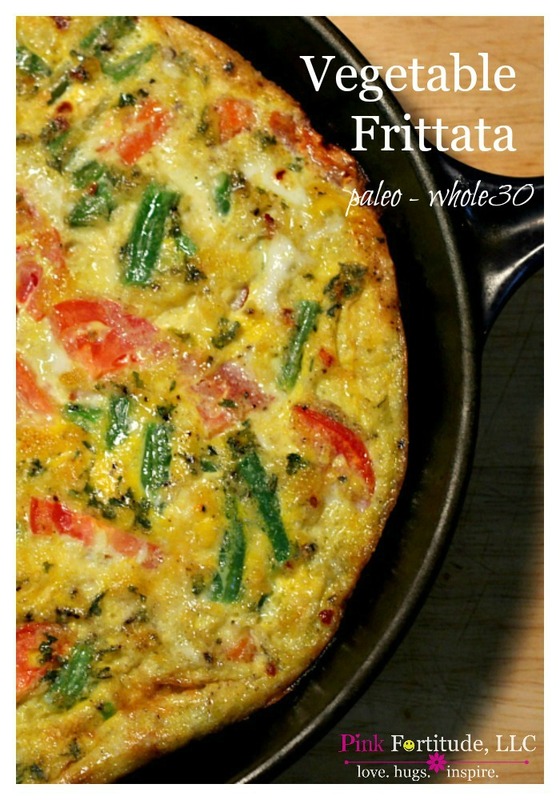 I’ve always been intimidated with the frittata, and was nervous to give it a whirl. It’s easy. Seriously. Easy. You can fancy it up of course, but I’m all about quick and easy. The catalyst for making this was to participate in the Food Desert Challenge. I wanted to make a healthy breakfast with leftover vegetables. You can use leftover vegetables, frozen or fresh vegetables. The key is to ensure that the entire surface of the cast iron skillet is coated with olive oil. You heat it over the stove top, and then cook it in the oven. If you really want to get wild and crazy, you can place it under the broiler for the last couple of minutes. I know, right?!?!? I actually had to look up the difference between a frittata and a quiche. I guess the quiche is made with cream and goes directly into the oven. But hey… quiche is soooo 1980. 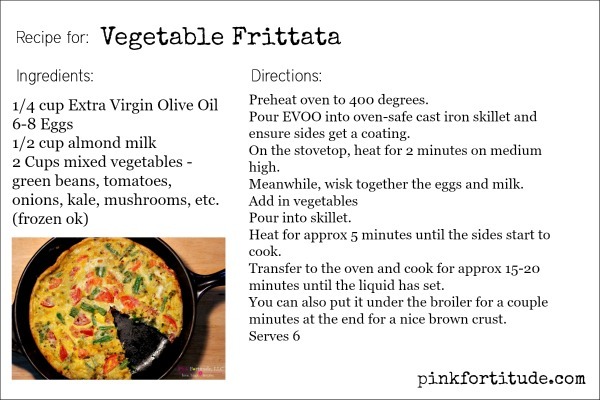 Frittata is much more fun to say! 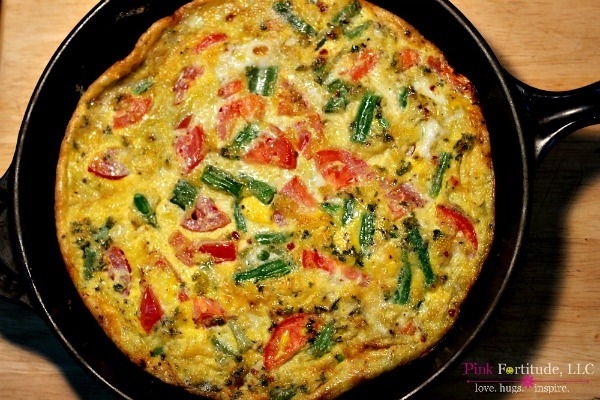 Love, hugs, and real men eat frittatas too! This is so good that my mouth is watering! May just try this today. I’ve scheduled this to be my daily “How-to” on my The How-to Guru facebook page for this coming Sunday morning! Yum! Sounds awesome! I’m paleo too and can’t wait to try this! Found you at SITS! Hi I’m Anne from Birdsong Bits and Pieces (https://birdsongbitsandpieces.blogspot.com), and I found you through the Inspire Me Tuesday blog hop. 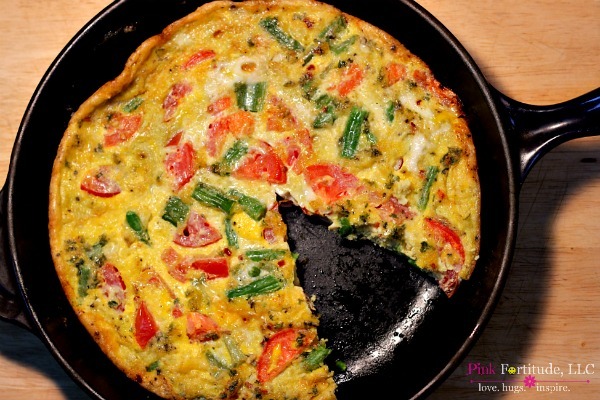 I love cooking in a skillet and this frittata looks amazing! Especially since I’ve been trying to go vegetarian lately . Thanks for sharing this recipe! Anyway, have a wonderful day, and I hope you can pop over to my blog (https://birdsongbitsandpieces.blogspot.com) sometime to say hi! This would be perfect for weekend brunch! Thanks for sharing at Merry Monday! Oh my gosh, I make (and eat) almost this exact meal nearly every single day…but for dinner! I’ve never tried adding almond milk though. Maybe I’ll give it a try tonight and see if it makes a difference?